Darryl Stallworth ’92 is a criminal defense attorney with a solo practice in Oakland, California. 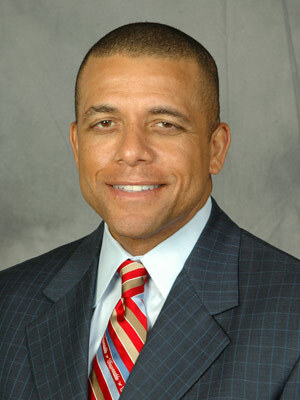 Before starting his own law office, Darryl was a partner at Taylor, Goins & Stallworth LLP. Previously, he spent 15 years as an Alameda County Deputy District Attorney. 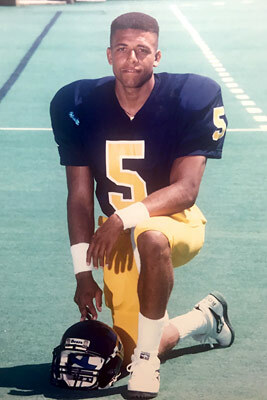 As an undergraduate at UC Berkeley, Darryl was a three-year starter and captain of Cal’s varsity football team. What do you enjoy about your current work? I love having the ability to positively change people’s lives. I love being able to give them counsel, comfort, and peace of mind, to resolve cases that seem unresolvable, and to come up with solutions that give them honor and dignity. I help them through the scariest, darkest parts of their lives. I’ve watched them go through it from both sides now, and I’ve seen them trembling. Providing them with calm and peace is what I enjoy most. What did you do after law school, and how did that lead into your current work? After I took the bar in July of 1992, I started working at the Alameda County District Attorney’s office. When I was sworn-in to the bar a few months later, I officially became a Deputy District Attorney. I thought I would stay five years, but I stayed for 15 years. Then I was in a partnership for about two years before opening my own practice. What did you do before coming to King Hall as a student? I was a political science major at Cal and played varsity football. Football was my passion. I had loved playing it since I was a kid. I was a three-year starter and captain of the team. I walked on and made a lot of really good plays. The coach, the legendary Joe Kapp, liked what I did and kept putting me in the game. This went on for a while, and then, when I was 20 years old, I made my first negotiation, which should have shown me my future as a lawyer. I told the coach I should have a full football scholarship. I played as well or better than the players who were on scholarship. The coach said he would think about it. Two weeks later, he came back and said, “You’re right.” After that, I always had more confidence in my ability to take a position and explain it. What brought you to King Hall? I always wanted to be a sports star. I wanted to be on TV, make a good living. But in football, the odds are small even if you have talent. In high school, I was valedictorian, class president, student body president, and my senior year, I had an internship through the Constitutional Rights Foundation. The foundation identified high school students with high potential and gave them stipends to attend workshops about careers. I saw trials in the District Attorney’s office. Even though I wanted to be a football star, that was always in the back of my head. When I wasn’t drafted, I went to work for a law firm as a courier. The partners took me in like a second son. One of them, John Loper, asked me why I wasn’t going to law school. I was planning to train for the Highway Patrol. He suggested I take the LSAT. If I did well, I could apply to law school. If I got in, I could see if there was a way to pay for it. I hadn’t even applied to Davis, but Sharon Pinkney, Assistant Dean for Admission and Enrollment at the time, called me. She said I should come take a look. I had always driven past Davis without stopping. When I visited in the winter of 1988, I immediately loved the small school atmosphere. Cal was so big it could blow you away. My high school had 300 students, and I felt like I was back in that environment. I applied, and after I was accepted, Sharon Pinkney found a scholarship that paid half of my expenses. I knew Davis was a place that was conducive to being a good student. It didn’t have the distractions of USC or some of the other places I had applied. What is your favorite King Hall memory? Orientation week. Here were some of the brightest people in the world, and they were scared out of their minds. It was the first time in my life that I could really be a pure student. Since I was six years old, I had always had football practice and games. Now I was 23 years old, and I only had to go to class and study. Walking into King Hall was like something out of a movie. Dan Fessler looked exactly like you would expect a professor of contracts to look. What class at King Hall served you well in your career choice? Criminal Law and Evidence with Professor Richard Wydick. I remember him drawing stick figures to demonstrate hearsay and exceptions. I found Criminal Procedure and criminal Law fascinating. Did you participate in student organizations? I was president of the Black Law Students Association (BLSA) my second year. I do similar work with my local bar association now. Do you have any advice for current law students? Be passionate about the study of law. If you aren’t, it may not be what you want to do with your life. What sustains me is when I open a case file and get excited. Or when I walk into a courtroom and still get butterflies in my stomach after 25 years. The type of work I do is emotional, but whatever you’re doing, be passionate. That’s your affirmation that it’s what you’re supposed to be doing with your life. Do you have any advice for students seeking jobs or internships? Come out to bar association meetings and take advantage of legal referral programs. Come to the courthouse. When people ask me about jobs, I tell them to come watch me in the courtroom, and then afterward I’ll introduce them to people. That puts them on the radar of lawyers and judges who might be hiring or know someone who is. I love King Hall. I love what it does and what it stands for. I had the opportunity to understand law in a great environment with a great faculty. I feel I’m part of a legacy, and I’m happy and humbled to be part of it. Everybody enjoyed and appreciates their experience at King Hall, including me. © 2017 - The Law Office of Darryl A. Stallworth - All Rights Reserved.